Flyer front and back for the final Herbal Tea Party after more than three and a half years at the New Ardri. 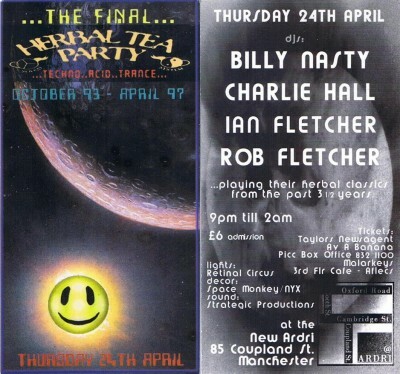 The sold out night ha Herbal favourites DJs Charlie Hall (Drum Club), Billy Nasty (Vinyl Blair, Shi-take), and residents Rob Fletcher and Ian Fletcher playing Herbal classics from over the years. techno, tech-house, trance, acid, electro, dub house, progressive house.